WASHINGTON, D.C.—Dutchman Geert Wilders is unlike any other lawmaker in the world—his home is a secret government safe house, he can’t walk alone, go to the movies, or even out to dinner without armed guards. Wilders is a political prisoner in his own country and he’s given up the most basic freedoms—like personal privacy—which we take for granted just so he can express his beliefs. 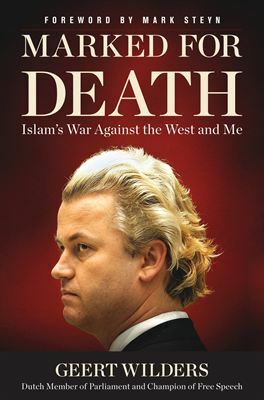 His explosive new book, Marked For Death: Islam’s War Against The West and Me, tells the story of his fight for the right to speak his mind and never back down, even when his life is on the line. European nations have already established local courts that rule according to Shariah law, which devalues the court testimony of women, reduces their inheritance rights, and allows husbands the right of instant divorce. Many believe it could never happen inAmerica; then again, many believed it could never happen inEurope. Regnery Publishing is the oldest conservative publisher in the country, proudly publishing since 1947! Located in Washington, D.C., our imprints now include Regnery History, Little Patriot Press, Regnery Kids. 'Marked for Death' has been mailed. Didn't get one? DM us!